Providing students of economics, politics, and policy with a concise explanation of public choice, markets, property, and political and economic processes, this record identifies what kinds of actions are beyond the ability of government. Combining public choice with studies of the value of property rights, markets, and institutions, this account produces a much different picture of modern political economy than the one accepted by mainstream political scientists and welfare economists. It demonstrates that when citizens request that their governments do more than it is possible, net benefits are reduced, costs are increased, and wealth and freedom are diminished. Solutions are also suggested with the goal to improve the lot of those who should be the ultimate sovereigns in a democracy: the citizens. 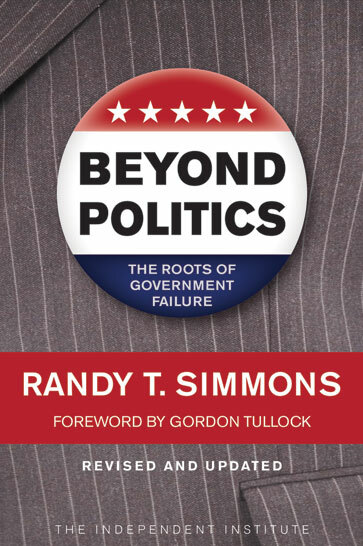 Randy T. Simmons is a senior fellow at the Independent Institute, the Charles G. Koch Professor of Economics, the director of the Institute of Political Economy at Utah State University, and the former mayor of Providence, Utah. He is also a member of the board of directors of the Utah League of Cities and Towns as well as a member of the Utah Governor's Privatization Commission. He is the author of several books, including The Political Economy of Culture and Norms. He lives in Providence, Utah. Gordon Tullock is a former professor of law and economics at George Mason University and the author of numerous books, including The Calculus of Consent. In 1996 he was elected to the American Political Science Review Hall of Fame.